Here is the box (I borrowed it from one of the gift baskets that we received from work). 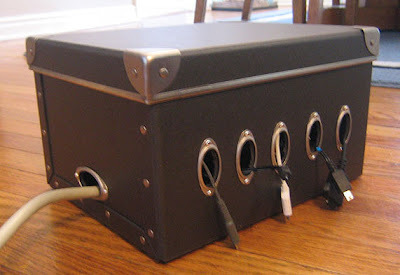 We drilled the holes in the top and one in the back for the power strip cord. The box looks great and like a great idea!...just remember to turn off the power strip when you're not charging anything! Adapters that are plugged in use quite a bit of electricity even when they aren't charging anything. Oh, good idea. Thanks for the suggestion! 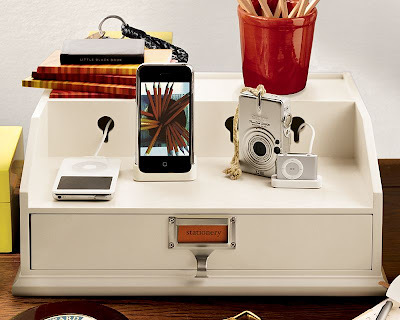 Sonja - will you please let me know where you found the examples/instructions on the other DIY charging stations? I actually saw the page about the 2nd one on your site but can't find it now. Thanks for your help! 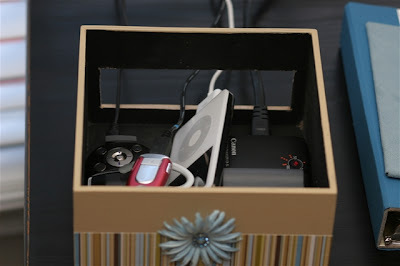 Judging by the photo of the 1st charging station(double click to enlarge), she took an existing box (maybe a photo box? )and cut one large hole in the back. That's pretty much what I did except with a couple extra holes. Pick a box, cut some holes, and you're ready to go! Good luck.